After Opera Garnier, let's visit Opera Bastille in Paris. Les Toryens is a French grand opera in five acts by Hector Berlioz, based on the poem Aeneid by Virgilius. It lasts five hours, so we will not be able to take a train before 20.25 to come back to Brussels. Unfortunately this time I have been slow in publishing the activity, and the cheap tickets are all gone. The cheapest ticket is now Protected content , and if you are interested you'd better hurry up. We will decide at a later stage whether to go to Paris on Saturday (with a nice dinner) or on Sunday. 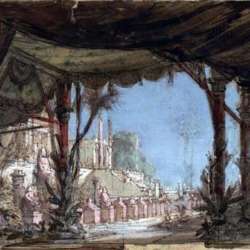 The photo of the activity is a stage design for the premiere of the opera, representing the gardens of Dido on the shores of Carthago.